I observe a revived interest in Scrum. I observe how people, teams and organizations re-discover Scrum. Scrum has the simplicity they grasp for. They see the value Scrum brings. Simple and valuable, not easy. 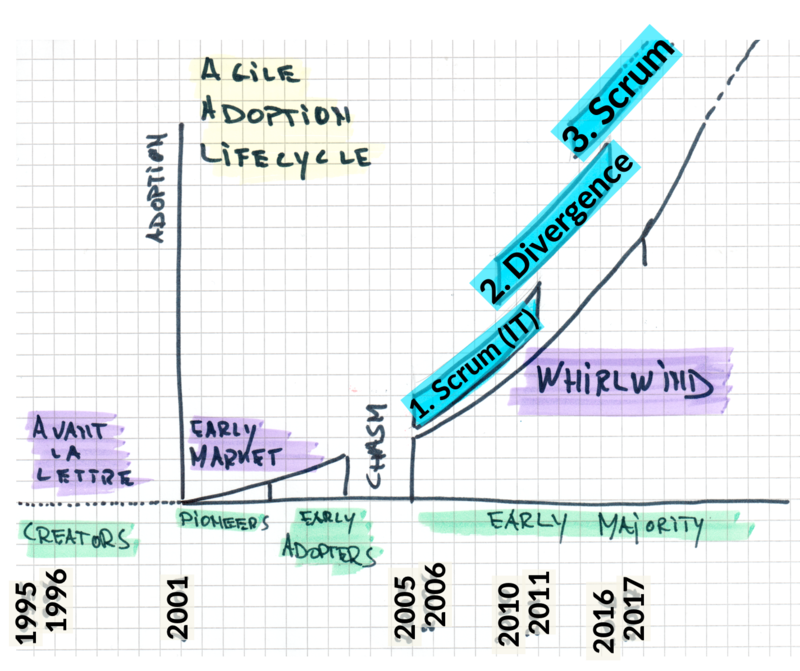 In a forward-looking observation I described it as the third Scrum wave that is rising. Scrum is simple indeed, yet has so many aspects to be discovered by so many organizations. Scrum serves a journey of product discovery. Adopting Scrum is a journey of discovery in itself. Scrum is a simple, yet sufficient framework for complex product delivery, for managing complex challenges. There is a high cohesion in the minimalist set of rules and advised activities of Scrum. There is no such thing as individual Scrum practices. Scrum lays down essential boundaries within which people self-organize, within which people devise a way of working tuned to their own context. Scrum can wrap many practices. When applied well, the integral result is still… Scrum. The themes of the recent past of Scrum were ‘scale’ (volume) and ‘divergence’ (different names and movements). Distractions. People, teams and organizations realize that it did not result in the agility they need in their complex context. I observe a revived interest in the cohesion of Scrum, the framework as a whole. People, teams and organizations learn that over-focusing on isolated elements of Scrum has not helped them tackle their complex challenges and humanize their workplace. While rediscovering Scrum, as a whole, people, teams and organizations discover that Scrum still leaves plenty of room for their context-specific needs. Scrum is designed to holistically support people, teams and organizations to create, maintain and sustain complex products. Scrum does not replace people’s intelligence and creativity, rather provides a frame for people to operate within and create valuable results. Scrum is intentionally low prescriptive. 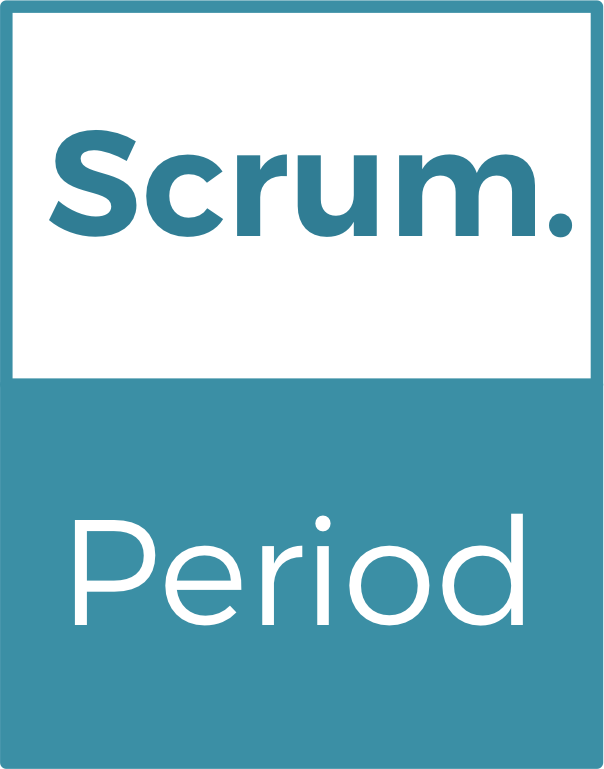 Scrum offers a limited set of mandatory prescriptions, which in turn allow many variations to apply the rules. Scrum most often does not fit the existing, rigid structures of many organizations, the hidden impediment to achieve true agility. Stick with Scrum. Consider the core framework to be immutable. Period. Start small. Through practice all people involved will ingrain new behavior, enact the Scrum Values and grow a new working culture, a more humanized workplace. Twisting Scrum, hacking into the basics of the framework breaks its cohesion, covering up dysfunctions rather than revealing them, probably disregarding the principles and foundations upon which Scrum is founded, rather than promoting great behavior. Such versions and implementations are possible. Isolated use of Scrum’s terminology or individual elements is possible. They might look like fun. They might work. They lack cohesion. They are not Scrum. The 3rd Scrum wave is rising. Will you sink? Will you swim? Be a laggard of the second wave? Or will you surf? On a personal note I want to add that I am delighted to see a shift from ‘Agile Coach’ to… Scrum Master. A good sign. A sign also that the need is real to have someone working with the teams and with the organization in fostering a healthy environment, an environment where innovation and creativity can emerge, where people can demonstrate traditionally unsafe behavior. All events organised in Scrum are designed to be forward looking. Adaptation follows inspection. Feedback from observable results is meaningless if not applied. All assessments, evaluations and inspections we undertake in Scrum primarily serve the purpose of working on the most valuable future. Scrum inspires us to shift our perspective from solely judging the past and checking actuals towards planning and innovating for an unknown future. In short, focused iterations we reflectively shape the future while embracing unanticipated surprises. This is the spirit through which we act. We act on forward looking observations. This is the spirit through which we can consider the future of Scrum. 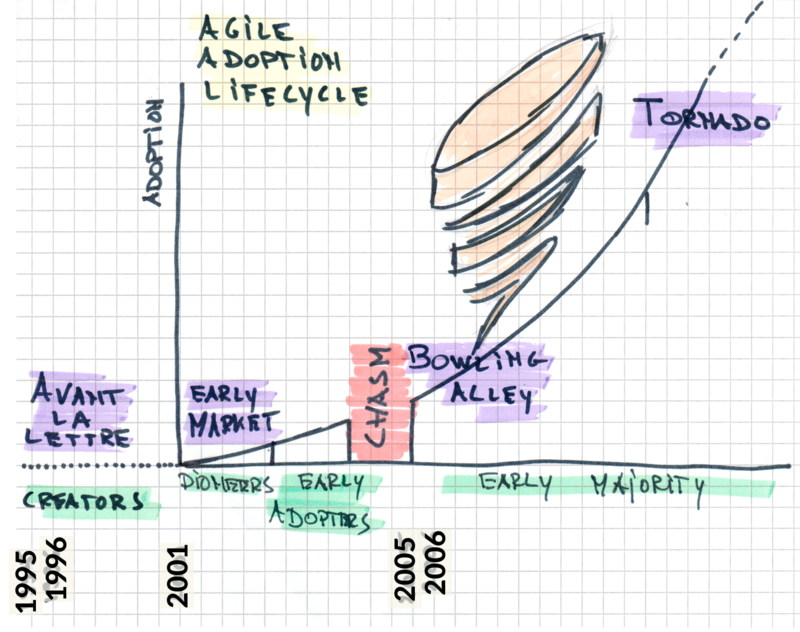 Rather than glorifying the past of Scrum, we anticipate the value ahead. We aim at surfing the wave. We shape the wave. THE 3RD SCRUM WAVE IS RISING. WILL YOU SINK? BARELY SWIM? OR WILL YOU SURF? 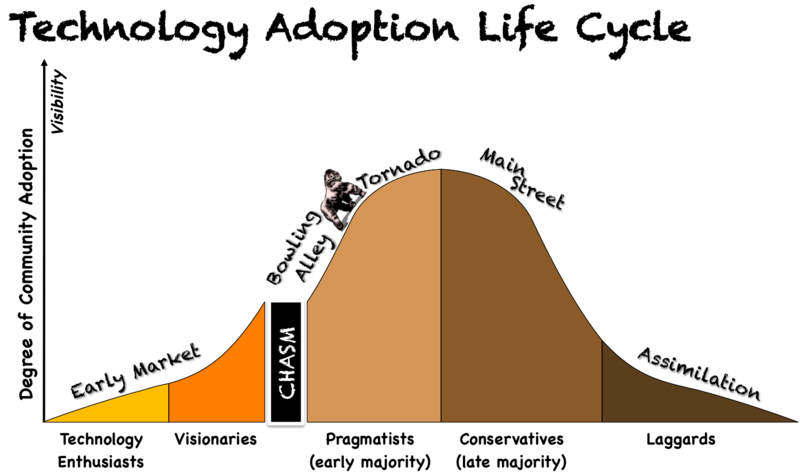 ‘Agile’ started crossing the chasm as from 2005-2006, much enabled by the increasing popularity of Scrum. The Agile way of Scrum became an accepted way of creating and delivering products. In the subsequent 1st Scrum wave a growing number of teams discovered the first-level benefits of Scrum, albeit predominantly from an IT perspective. Organisations moved away from endless sequential phases and gateways, and began exploring the advantages of iterative-incremental delivery. 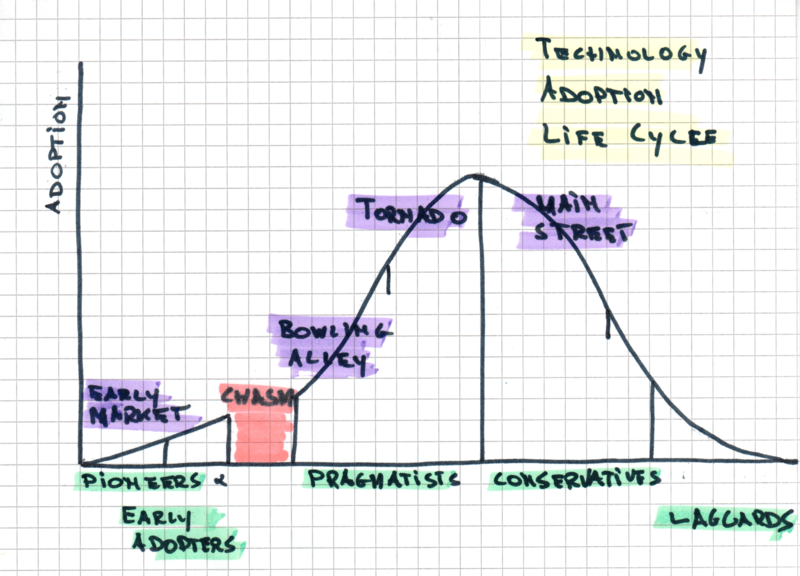 The 1st Scrum wave was mainly about adopting Scrum, a first encounter, the start of a journey of discovery. 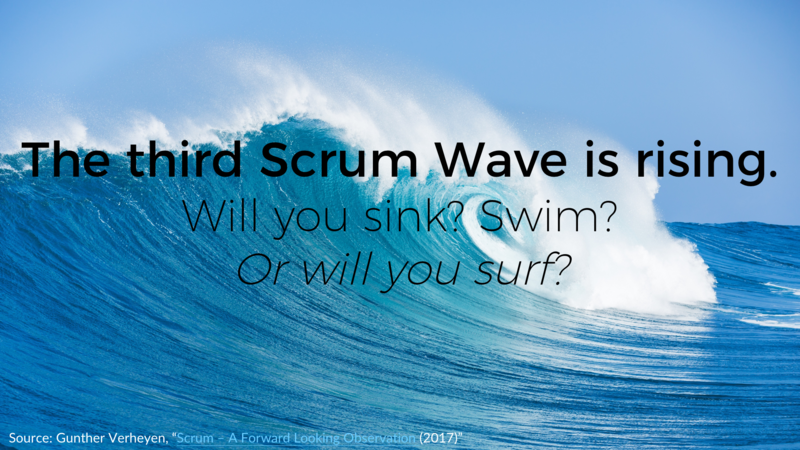 In the slipstream of the 1st Scrum wave, sub-groups and derivative movements took off, new movements and methods were invented, introduced, launched, and often disbanded again. Divergence in itself is great, unless the overall result is dilution and opacity. Rather than into variety, the divergence turned into scattering, even with Scrum being the actual standard, even with the definition of Scrum being formalised by its co-creators in 2010 in the Scrum Guide. A bowling alley of problems to be addressed appeared, a wide range of pins. Some pins appeared to be left unaddressed by common Scrum implementations. Some pins were raised to challenge presumed weak spots of Scrum, challenges presented as unaddressable through Scrum. On top of this slow evolution, 2010-2011 saw a seemingly sudden desire of large organisations to transition to this ‘Agile’ thing, fast. The tone for the 2nd Scrum wave was set, a wave of diverging Scrum. Scaling became a thing. Parts of the Scrum terminology became standard vocabulary, but at the same time the tangible rules and principles underlying the Scrum framework were pushed to the back, their purpose snowed in under resurrected needs for layers, titles, roles and structures, at scale. 2016-2017. It takes time to replace the industrial views on the creative act of product delivery. Rat races continue, Scrum is underused as a way out. Too often still the organisational waste, abuse and impediments, ruthlessly highlighted by Scrum, are ignored. Yet, more people and organisations than ever continue their quest to stop more hamster wheels, to create more room to reflect, to improve, to innovate. The 3rd Scrum wave is fuelled by the desire, the drive for rhythm, focus and simplicity. Agile and Scrum are recognised as two inseparable ingredients for healthier and more humane ecosystems that deliver better products. The awareness keeps growing that it starts and ends with people, not with procedures, tools or games. People embrace the Scrum values as a catalyst to re.imagine their Scrum, to re.vers.ify their organisation. Convergence appears on the horizon, where the rage of scattering, where the tornado starts calming down. We sow seeds. We fertilise the grounds. We help converge product delivery initiatives in a Scrum Studio. We help the shift from traditional to empirical management. 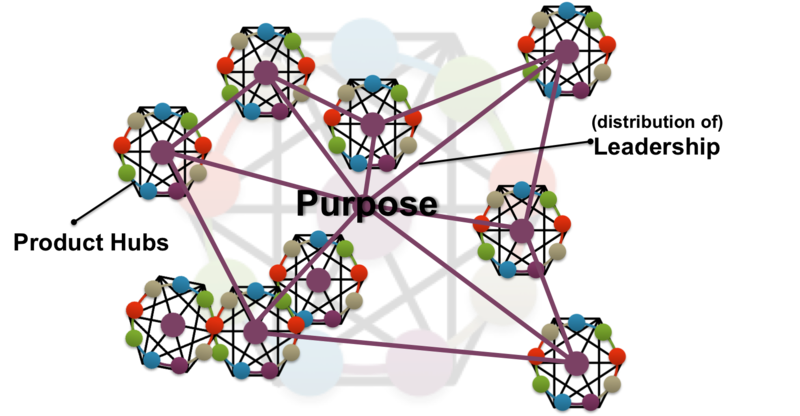 We envision a future, networked structure, a nervous system of product hubs and distributed leadership. The 3rd Scrum wave is about enacting Scrum, discovering how the well-defined and clearly stated framework of Scrum leaves plenty of room for variation, a diversity of strategies to employ Scrum. In 2016 Scrum turned 21. We have come a long way. We look forward. We walk on. We re-vers-ify. We re-imagine our organisations.